All components of SCP-3524 are contained at Site-104 on a 20 meter by 20 meter plot of outdoor land. 1 meter high concrete walls are to surround the entirety of the containment zone to ensure that SCP-3524 does not expand to the point of being unmanageable. The containment zone is to be kept free of all wildlife. Surveillance of SCP-3524 is to be achieved via security camera. New instances of SCP-3524-2 being introduced into the containment zone are to be placed 0.5 meters away from any other instances of SCP-3524-2 or SCP-3524 itself. Expansion and growth of instances of SCP-3524-2 are not to be interfered with. Assimilations of SCP-3524-2 into SCP-3524 are not to be interfered with. Personnel are to maintain a 20 meter distance from the containment zone at all times. Communication and interaction with instances of SCP-3524-1 requires Level-3 Clearance or higher and is only to be initiated on an as-needed basis. Updated as of 04/██/2017 SCP-3524 currently within the containment zone are not to be interacted with under any circumstances. All activity inside of the containment zone is to be documented with video recording. Instances of SCP-3524-1B are to be kept separate from all other instances of SCP-3524-1 in an isolated instance of SCP-3524-2 (henceforth referred to as SCP-3524-2A) that is not allowed to expand or assimilate with SCP-3524. SCP-3524-1B are to be supplied with 5 randomly chosen instances of SCP-3524-1 every 3-4 weeks for feeding. Once an instance of SCP-3524-1B is identified, a Class-NV Sedation Gas is to be spread throughout the entirety of SCP-3524. Once the sedative takes effect, the instance of SCP-3524-1B is to be removed from the main containment zone and placed in SCP-3524-2A. Description: SCP-3524 is the collective designation for a population of anomalous humanoids (SCP-3524-1) and the artificial constructs created by said population (SCP-3524-2). SCP-3524-2 are the artificial constructs of SCP-3524-1 that appear in heavily forested areas, primarily along the east coast of North America. They resemble small villages and are made of clay, stone, and small sticks. SCP-3524-2 are populated by 20 to 40 instances of SCP-3524-1. SCP-3524-1 are 2.5 centimeter tall sapient humanoids with green pigmentation. All instances of SCP-3524-1 share a single language and culture. Details of this language can be found below in Section [The Language of Jomuź]. Translated texts written by SCP-3524-1 has revealed that they call their species “osi”, which translates to “person”. The society that SCP-3524-1 lives in appears to function similarly to feudal societies such as those of medieval Europe or Japan, with a singular leader and a pyramidal caste system of four five subordinate classes. The lowest class in this caste system is the źifasuo1. The źifasuo are tasked with all reproduction of SCP-3524-1. SCP-3524-1 reproduce asexually, and appear to grow from the ground in a manner similar to a plant. The źifasuo will plant seeds every 3 weeks that will grow into new, fully developed instances of SCP-3524-1 over a 1 week period. It is unknown where these seeds come from. The next class in the caste system is that of the lodigo2. The lodigo gather supplies such as clay, stones, and twigs in order to continue building and expanding their villages as well as for the ivo. Lodigo have been recorded to travel a maximum distance of 3 meters over land to obtain materials, and may dig up stones or clay a distance of up to 2 meters underground. The third class in the caste system is the ivo3. Ivo are the SCP-3524-1 that create tools and building supplies. Recorded tools and supplies created by ivo are crude hammers, axes, saws, and nails. Added 03/██/2017: The ivo will also create swords and spears. The second third highest class in the caste system is the nisugo4. The nisugo are the main builders and expanders of SCP-3524-2. They will build and repair structures such as huts. Added 03/██/2017: The nisugo will also build traps to kill others. Added 03/██/2017: A new class has emerged in the caste system, that being the level of miźuo5. The miźuo will go to battle with neighboring villages and attempt to kill its źu. The miźuo will not act without direct orders from their źu. The final and highest ranking class in the caste system is that of the źu6. Each instance of SCP-3524-2 only has a single źu. All SCP-3524-1 in the caste system will follow the orders and wishes of the źu. Roles in the caste system appear to be pre-determined before growth of new instances of SCP-3524-1. Once fully grown, they will immediately assume their appropriate role in the society. SCP-3524-1 have a typical lifespan of 215 days and will often seek out areas of sun to occupy. They do not consume food, and due to the pigmentation of their skin and fondness for sunlight, it is theorized they sustain themselves through a process similar to photosynthesis, although dissections of deceased SCP-3524-1 have shown their cells to contain no chloroplasts. SCP-3524-1 use a form of basic currency for purchasing basic goods and services, such as tools, repairs, and expansions. They are a peaceful species and have not been observed attempting to harm one another. The base instinct of SCP-3524-1 is to expand their village. This instinct overrides other basic needs. SCP-3524-1 will continue expanding their village indefinitely if the village or SCP-3524-1 is not terminated. If two or more villages are located near one another and come into contact, interaction between the neighboring SCP-3524-1 will be friendly and diplomatic. Each population will aid the other in expanding their villages. In rare cases, the populations will merge and become one, instead of acting as cooperatives. Incident Log - 03/██/2017: Containment of SCP-3524 successful as of 02/██/2017, 6 days prior to the time of writing. 5 instances of SCP-3524-2 containing a total of 133 instances of SCP-3524-1 are currently contained. 2 instances of SCP-3524-2 expanded to the containment zone boundary within 4 days. SCP-3524-1 occupying these instances of SCP-3524-2 became extremely distressed and mild destruction of these villages ensued. Incident Log - 03/██/2017: 4 of the 5 contained SCP-3524-2 have reached containment zone boundaries. The respective populations have begun fighting each other for control of more territory. At the time of writing, an estimated 50 SCP-3524-1 have been killed in these wars. Incident Log - 03/██/2017: All contained SCP-3524-2, including new additions to containment, have reached containment zone boundaries. All 150 instances of SCP-3524-1 have become agitated, the usual caste system has been abandoned completely, and SCP-3524-1 have become extremely violent towards one another, regardless of origin. 33 deaths have been recorded so far. Incident Log - 03/██/2017: 3 instances of SCP-3524-2 have been added to containment, and each new instances reached containment boundary within 2 days. New instances of SCP-3524-1 showed the same reaction as previously contained instances. A total of 83 SCP-3524-1 deaths have been recorded as a result. New additions to containment temporarily halted by order of O5-█. Incident Log - 04/██/2017: Instances of SCP-3524-1 attempted to damage containment boundaries. A Class-NV sedating gas was administered to SCP-3524. Boundaries were repaired. 25 more deaths of SCP-3524-1 have been recorded. Various SCP-3524-1 have begun taking on a slightly bluer tone to their skin. Incident Log - 04/██/2017: SCP-3524-1 have written messages on many of the walls in SCP-3524, all translating to the words, “free us”. A total of 6 instances of SCP-3524-1 have been observed with a completely blue pigmentation. New additions to containment halted indefinitely by order of O5-█. SCP-3524-1B are a subset of SCP-3524-1, first observed by Dr. ██████ █████ on 04/██/2017. They are identical in size and shape to SCP-3524-1, but their pigmentation is blue, not green. SCP-3524-1B know the location of all other SCP-3524-1B at all times, regardless of prior interactions. SCP-3524-1B will often attack SCP-3524-1 and consume the victim after death. They will also attack SCP-3524-2 themselves, destroying buildings and infrastructure. SCP-3524-1B have not made any attempts at damaging containment zone boundaries. SCP-3524-1B adhere to the teachings of U źuty ich Isitoo7, a cult formed by SCP-3524-1B. U źuty ich Isitoo worship Dr. ██████ █████ as U8, and believe that one day, he will free them from containment, as well as destroy the entirety of SCP-3524, excluding themselves. Tu osofa U źuty ich Isitoo. Tu osofa uvodos. Tu osofa yiźuot. Uv osofa bidoto. Uv osofa ud. Sogup osofa puyoźu U, isit osofa Ri buchuoty. Uguźu osofa chisi jivo nud gi. Źumus gi nud chij źumus U chisi źuyosuabo judu yiyogoźuo. Uguźu osofa Tugoty chisi. Uguźu bun chij tsumud tiv tigav U yiyogoźu so osofa. Uramu osofa nigo chisi. Viy bun chij nutid Ri sudiv suyit osofa źuboty, utod Rio sofa. Yiyoguźu U nutid surod osofa sogup fujus osofa. Below is a translation of the Gim. We are the Followers to the One. We are the enlightened. We are the servers. We know the truth. We know the way. The One will lead us to the light, if we follow His guidance. We must destroy those who doubt. Only those who believe in the One must be allowed to see freedom. We must destroy Tugoty. Only by destroying our prison will the One be able to free us from it. We must think as one. Only by working through His bond will we achieve what we desire, what His will for us is. Through our sacrifice the One will free us and lead us to salvation. Whenever Dr. ██████ █████ is visible to SCP-3524-1B, they will drop to their knees, bow, and remain completely immobile until Dr. ██████ █████ leaves their line of site. They will not attempt communication with Dr. ██████ █████ unless he initiates it. Utod uguźu yayiź. Uvoduv bidoto ifa. Nauźv U yayiź. Nufuz lipa yayiź. Poyatiy sobos. Toyiy Isito. Toyiy U yayiź yuty. Tuy yayiź iź. We will destroy nonbelievers. They do not know the truth. The One will free us. All are beneath us. Humanity will fall. The Followers will rise. The One will rise with us. We will be always. Foreword: The interview was conducted through note passing between parties. All text has been translated into English. The Interviewer has been instructed to pose as the divine being the Subject makes him out to be in order to gain needed information. Interviewer: Why do you call me that? Subject: You are the One, the One who will free us, raise us to the light. Subject: We bow before you, Great One. Interviewer: You can stand back up. Subject: Thank you, Great One. Interviewer: Can you tell me why you attack your brethren? Subject: Yes, Great One, but surely you must know. If you did not know, you would not be the One. Interviewer: Yes, I do know. But I wish to hear from you. Subject: They are not our brethren, Great One. They are weak, blind, naïve fools. They do not know the power of You, of the One. We destroy those who do not know, who do not believe in your name. The name of the One, for we are the Followers to the One. Interviewer: You shouldn’t kill the others. You’ll endanger yourselves. Subject: What do you mean, Great One? Interviewer: You may be a different color, but you’re still the same species as the green guys. You can’t just kill them. Subject: And what does the Great One think of the Empire? Subject: The Empire of Tugoty! Interviewer: If you’re referring to the villages, you need to stop destroying them. Subject: You are not the One. We destroy in the name of the One, in the name of freedom. We must be free of our prison. We must expand. We must not be kept from expanding. Interviewer: You cannot expand anymore. You need to stay where you are. You are here for your own good. Closing Statement: At the conclusion of the interview, SCP-3524-1B attacked Dr. ██████ █████, preventing continuation of the interview. They were subdued and placed back into containment. On 06/██/2017, Foundation personnel planted in the US National Park Service recieved reports from hikers in [REDACTED] National Park of "a bunch of villages with green people". MTF Tau-22 ("Forest Fires") was dispatched, and upon arriving, discovered 4 instances of SCP-3524-2, populated with aproximately 95 instances of SCP-3524-1. Members of MTF Tau-22 reported that while only 2 of the SCP-3524-2 had expanded to touch one another, SCP-3524-1 occupying both of the touching villages were working together in order to expand towards the solitary SCP-3524-2. They reached the solitary villages within 5 minutes, and began to assimilate them into each other. 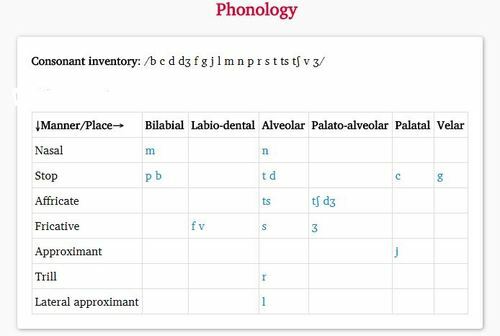 The basic consonant phonology of Jomuź. The Foundation has been successful in translating most of the language, now known to be called “Jomuź”. In Jomuź, there are no specific genders. There are only masculine and feminine pronouns. The grammar structure of Jomuź follows the word order of Verb-Subject-Object-Oblique. For example, “Mary opened the door with a key” would become “Opened Mary the door with a key”. At the time of writing, the Foundation possesses a dictionary of 2,000 words of Jomuź translated into English. 7. Translation: Followers to the One.